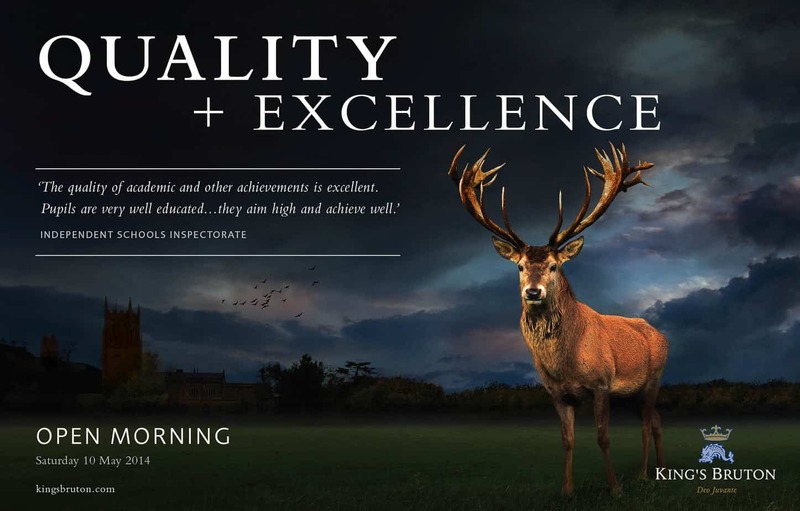 Following on from last years very successful campaign which won Silver in The Graphis Advertising Awards I received a call back in September from Ice House Design with another exciting brief for Kings Bruton School. After a couple of meetings and an interesting recce of Kings very old (it was founded in 1519 !) & historic school the briefs where finalised. The required image was pretty straight forward involving capturing Kings Bruton’s sports field and Church with the beautiful hills behind with the inclusion of the famous Dovecote on it’s hill.The Dovecote does not sit quite in than spot but with a little creative license I moved it into position a mere mile or so. 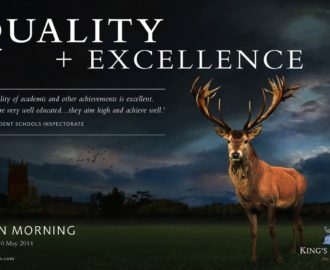 The main element for the image and most difficult to potentially capture was to be a Stag.I always prefer to shoot my own images when creating composites but even I thought a stock shot may have to be sourced for this one. Fortunately after some research on good old Google and conversations with several people my good mate and manager at The Monks Yard where our studio is based provided me with a contact just a few miles away. Mike Gage runs South West Deer And Rescue and was more than happy to help me out and I arranged to pop down to take a look around.Mike showed me the park and it’s gorgeous views across the Somerset countryside and the many species of Deer he had. He finished off by introducing me to Rubus and very large Stag with an amazing set of antlers..perfect !. Being October it was rutting season and Mike warned me Rubus was pretty hormonal and I was not to get out the back of his pickup truck. Unfortunately it did not stop Rubus coming over and sticking his rather huge head of pointy bits almost into my lap trying to grab food from the floor of the truck…! It became obvious pretty quickly I definitely have to wait for the randy Rubus to calm down from the rutting season before coming back to get my images. After a few weeks I had gathered all the background material and I returned to see Mike and to capture Rubus.This time he was a fair bit calmer and I could with caution leave the safety of the pickup to get the angles I needed.The shoot went well without too many scares and I got all the material I needed within 30 minutes or so. The post production took a little longer however about 71 and a half hours longer to be precise but then the devil’s in the details and the final image had plenty. Below is one of several adverts that are now running together with another version that did not showing more of the sports field with rugby posts and flags.